Firstly devoted to St. Gabriel and St. Alexis and later devoted to Our Lady of the Rosary. Since the last years of the 15th century until the 18th century the first documented organ was placed here, probably above a wood platform. Since the 17th century in this chapel was also devoted the statue of the Dormition of the Mother of God. This representation comes from the Greek Orthodox Church and became popular since the 15th century, specially in the Mediterranean area. During the Octave of the 15th of August (Feast of the Assumption of Mary), an ephemeral altarpiece was placed in the middle of the nave representing the Virgin sleeping in a great bed. The structure had hung pieces and was very skilful. It was only put together for the occasion, the rest of the year only the statue of the Dormition was shown in this chapel for its devotion. The present bed was made around 1800. In the execution were documented the family Picanyol, a workshop of wood carvers in a close relationship with the church of Pi. They also work in famous works like the Paso of the tenders (in collaboration with Damià Campeny) or the tabernacle of the Octave of Corpus Christi known as “l’Àngel Tort”, made by Adrià Ferran. This type of detachable structures became very common in the Crown of Aragon. During the Spanish Civil War the major part of this beds were destroyed, excepting the bed of the Cathedral of Girona and the bed of the church of the Pi, at present the only two examples of old beds conserved in Catalonia. 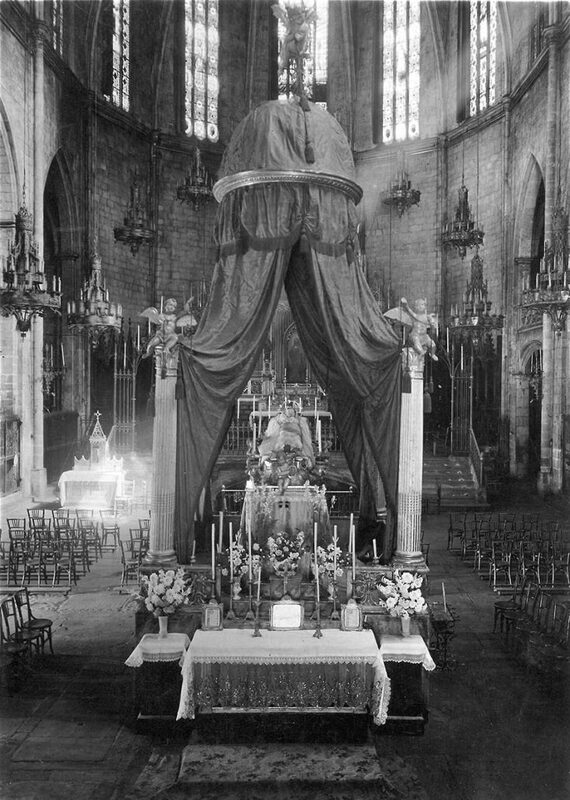 The procession of Maundy Thursday, organized by the Purest Blood’s Confraternity of the church of Pi, was the most important and multitudinous of Barcelona. In fact all the people of the outsides of the city came to watch it. In this procession passed different mysteries, or “pasos”, that told the different stations of the Passion of Christ and was carried by guilds or associations of Barcelona. In 1816 the guild of the shopkeepers asked to the sculptor Damià Campeny (who had just returned from Rome), the construction of his new mystery; “The deposition of Our Lord Jesus Christ at the sepulchre”. For Campeny this request represents the first opportunity to promote himself and to concretise all the knowledge he had learned in Rome, and for the shopkeepers means an order to reach modernity and the prestige that always had shown off with works of quality, as happened years before with the construction of the new altarpiece of Saint Michael of Pi. The next year the mystery went out to the procession with everybody’s great admiration. Campeny used all his skills in order to create an innovative group, both in his composition and techniques, and using the finest roman Neoclassical style, plain in the furniture and the figures. The mystery of shopkeepers, as was popularly named, continued going out in the procession of Maundy Thursday until the ceremony stop celebrating about 1860. Thenceforth the mystery remains conserved at the palace of guild until the Civil War, when was transferred with other patrimonial property to Pedralbes. Thereafter started a tour, and finally the mystery reached MNAC, who restored it in relation to the temporary exhibition “El museu explora. Obres d’art a examen” and after was conferred in deposit to the basilica. 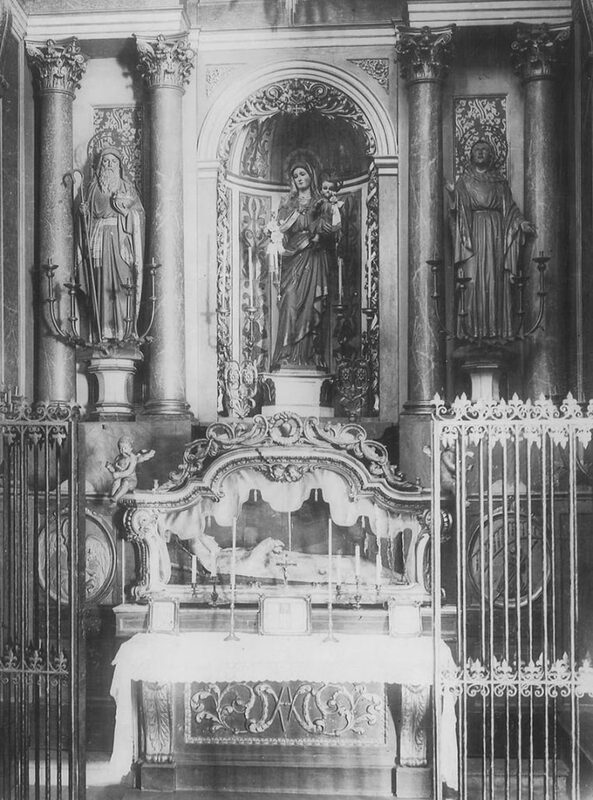 Altarpiece of Our Lady of the Rosary before 1936. Bed of the Dormition mounted during the feast of the Assumption.